Alongside and connected to the rise of Italian fascism came a revolution in the drinking habits of the Italian public. It might sound peculiar, but what has become known as THE Italian way to brew coffee in the home, Moka Pot (or Stovetop Espresso) Brewing is linked to the social, technological and economic changes that Italian fascism advanced during the 1930s. Prof. Jeffrey T. Schnapp in his article, “The Romance of Caffeine and Aluminum” (Critical Inquiry, Vol. 28 No. 1, Autumn 2001 U. of Chicago) covers this ground in detail. Schnapp shows how the Italian desire to move into the era of modernity in the early 20th century was expressed through the “marriage” between two, ostensibly very different materials, caffeine and aluminum. While my article summarizes him, I must accept all responsibility for any additions, misinterpretations or mistakes that may have entered it. Caffeine and Aluminum are two materials that carry a common symbolism linking them to the age of modernity: Lightness, speed and mobility, Strength, energy, and electricity, are terms that fit both these materials and are associated with the new lifestyle that modern man was seeking. While both caffeine and aluminum were isolated (or discovered) in the early to the mid 19th century, it was the fascist drive to make Aluminum the national metal of Italy in the 1930s that brought these two materials together in a way that would affect every Italian home! In 1933, Alfonso Bialetti fashioned and crafted the first Aluminum Stovetop espresso coffee maker. This coffee machine, The Moka Express, would find itself in 90% of all Italian homes (as well as in the Guinness Book of Records) thus changing the essence of Italian coffee culture. 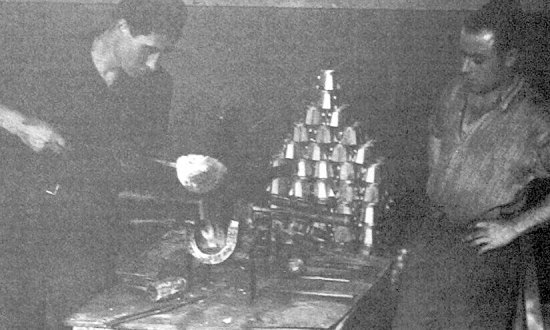 Bialetti changed not only coffee brewing technique but also the Italian social fabric. Coffee was generally consumed publicly. Public coffeehouses dominated the coffee trade in all aspects from buying and selling to roasting and consumption. They were the birthplaces of many ideological and political movements throughout Europe. Public coffee consumption was the realm of the male who made the coffee bar his home away from. Consumption of coffee by women was associated with their move to emancipation. These developments and concepts gave birth to what was to become THE ultimate Italian form of coffee: Cafe Espresso, a strong and powerfully intense cup. The 19th century saw a number of attempts to brew coffee with steam. The goal was to brew a strong cup of coffee very quickly. 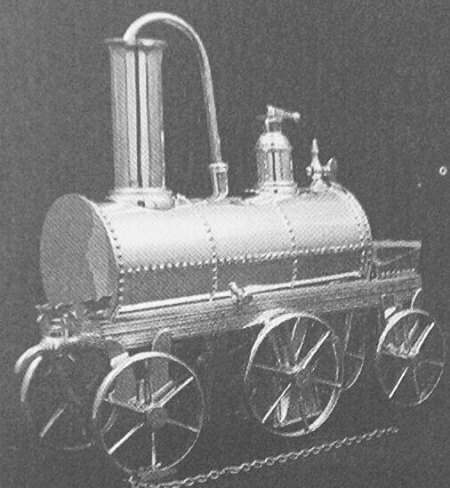 One coffee brewer actually took the shape of a train locomotive (see image) highlighting the connection between speed and power and the use of water boilers used for both modern travel and making “modern” coffee. In 1901 Luigi Bezzera filed his first patent for a large espresso machine. This machine, like the railroad locomotives, was a dazzling piece of equipment-loud, shining with brass fittings and manned with its own “train engineer”, the professional barista. 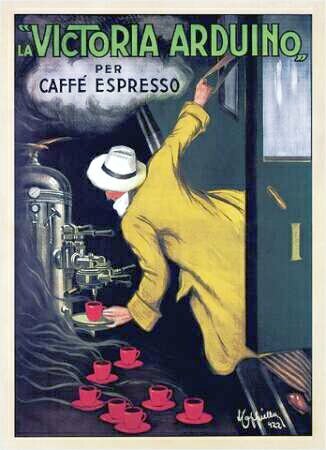 The Italian artist Leonetto Cappiello beautifully captured this association in the 1922 advertising poster created for “La Victoria Aduino”, manufacturers of espresso machines. How different than the simple coffee machines, like the Napolitana still used in the home. The home machines were like sedate tea brewers that brewed by letting hot water gently trickle over the coffee grinds. 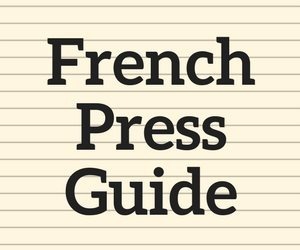 The Espresso brewed at the public coffee bar “was power-packed, intense and quickly consumed It translated the values of efficiency and excitement associated with the express train into an everyday beverage. In comparison to coffeehouse espresso the domestic coffee was but a slow and pallid imitation.” (Schnapp p 251). One can understand how the Espresso Bar became a magnet for the Italian man. 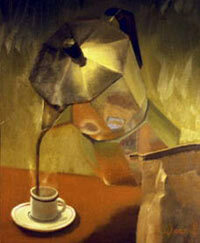 But, in 1933 Alfonso Bialetti invented a brewing system that changed the image of domestic coffee in Italy. His chances for success were increased as the invention brought about the marriage of two materials Aluminum and coffee. Beyond their appeal as symbols of modernity, these two substances were significant to the Italian nation during the 1930s. Fascism’s “March on Rome” wanted to create a break with the past and at once restore Italy to its old glory. The use of Aluminum would suit this two-fold desire. In a huge national advertising campaign during the ’30s, Aluminum would be described as being both AVIONAL and ANTICORODAL. “Avional”-from the word meaning “airplane”, would suggest the modern technological aspect highlighting both speed and strength. “Anticorodal”, “non-corroding”, would highlight traditional values, everlasting and sturdy. Coffee was also seen as highlighting nationalistic values, particularly, EMPIRE and AUTARCHY. “Empire”, in that Italy had invaded Ethiopia-a major producer of coffee beans. “Autarchy”, freedom from subjugation to the nations of the world, because Brazil had continued to supply Italy with coffee bean against League of Nations decisions to apply sanctions. 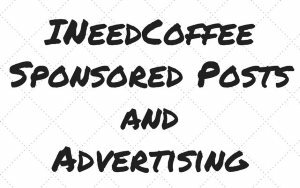 Coffee, a national beverage thanks to the spread of espresso bars during the beginning of the 20th century, and Aluminum, the national metal, wed when Alfonso Bialetti returned from France, where he worked in the Aluminum industry. He started his own machine shop in 1918 in an area of Italy known, since WWI, as a center for manufacturing metal house-wares. During the 1920’s Bialetti noticed the laundry methods used by local women. The wash was boiled in tubs with a central pipe in the middle. This pipe would draw the soapy water up and redistribute it over the laundry. Bialetti’s creative mind brought him to the conclusion that a simple coffee machine could be fashioned on this model and could produce real “espresso type” coffee in the private home. 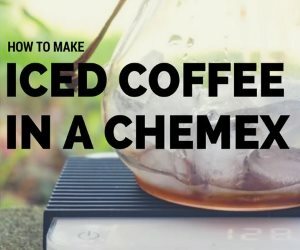 At this time, other Italians were busy trying to create new and better ways to brew coffee-using pressure rather than steam to extract the best from the coffee bean. But the high pressure-lower than boiling water solutions of companies like Gaggia were to take years of developing. These modern “true” espresso machines would remain fairly large and costly, using complex systems to attain their superior results. Italians were still used to the steam pressured “espresso” machines that dominated the coffeehouse scene and were, therefore, open to simpler solutions that would give them the same style coffee at home. 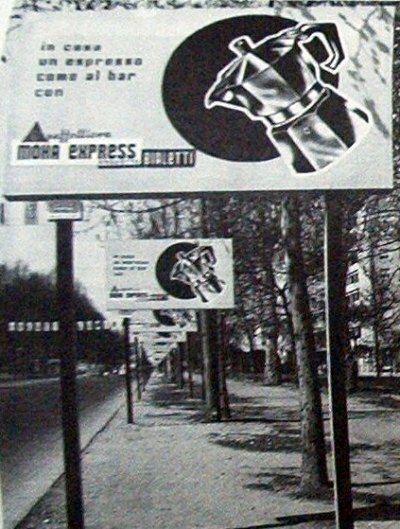 Alfonso Bialetti had the vision and invented the Moka Express, which would remain virtually unchanged until today. But Bialetti did not have the marketing success to move the revolution forward. Prior to the war (1936-1940), Alfonso was able to market about 10,000 units per year. He personally sold his product at stands set up at public markets held weekly. He advanced to regional marketing but never thought in terms of a national effort or of industrializing production. 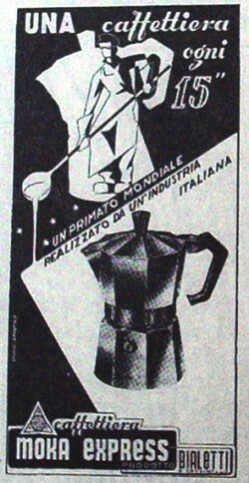 During the post-war boom, competitors entered the field and it was necessary to differentiate the Bialetti product. In 1953 Renato invented the company mascot, “omino con I baffi” (little man with a mustache). This character was a caricature of Renato’s father Alfonso and conjured up the image of the Italian father or dear elder family member who had lived his life in the coffeehouse. It was a symbol that evoked feelings of nostalgia and fondness. This patriarchal figure though is a man on the move. With his finger raised he could be hailing a taxi or commanding attention as he orders his espresso. Every year Renato Bialetti “conquered” Milan during its most important annual trade show “Fiera di Milano”. He rented every available billboard in the city and created outstanding installations. 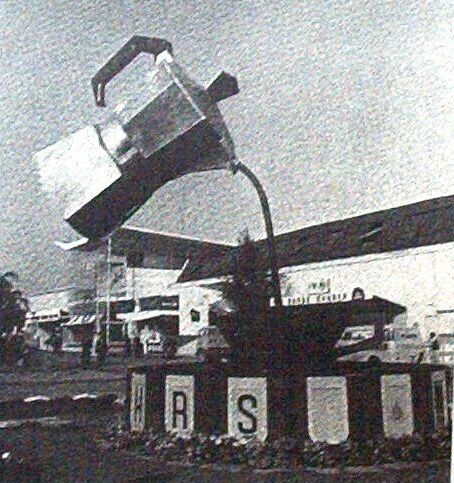 For example, in 1956, besides the booth in the Fair itself, Bialetti erected a huge outdoor sculpture consisting of a giant Moka Express supported by, what looked like, a stream of coffee being poured into an equally large coffee cup. Besides addressing the social and marketing factors, Renato addressed the organizational and industrial aspects. He moved production operations to a newly designed factory in the 1950s that was specially designed to efficiently move materials. He modernized while preserving quality craftsmanship at crucial stages of production. To this day the bottom boiler unit continues to be handcrafted by expert workmen just as it had been done in 1933. With this arrangement, Renato pushed production to 18,000 pieces a day or 4 million Moka pots per year! At this rate of production, we can well believe the claim that nearly 300,000,000 Moka pots have been sold since the 1950s. 90% of all Italian homes have at least one Moka Pot-making this a true symbol of Italy. While many competitors have moved exclusively into stainless steel models, the people of Bialetti continue to claim that the use of Aluminum improves the quality of the brew. The “interesting” aspect of this claim is that they say that the residue coffee from previous brews adds flavor and depth to future brews. It is not recommended to clean the Moka pot too thoroughly! It is true that Aluminum is an excellent conductor of heat and even heating of the water may contribute to the quality of the brew. 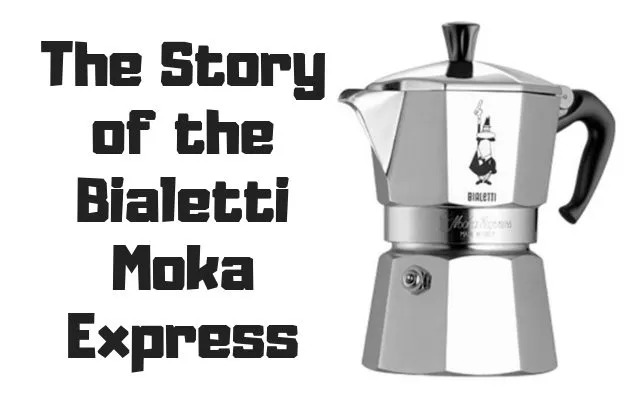 Bialetti’s Moka Express continues to be a respected Italian icon. In a recent survey of Italian design, the Moka Express ranked as the fifth best design to have come out of Italy in the 20th century. Its place of honor is alongside the likes of the 1957 Fiat 500, a 1946 Vespa and… Nutella, which won first place. 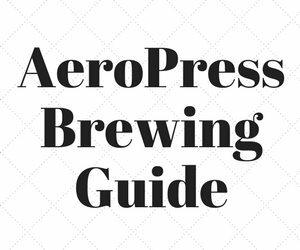 Stovetop Espresso Brewing Tutorial – INeedCoffee coffee brewing tutorial. Leonetto Cappiello – Wikipedia page on the creator of the 1922 poster La Victoria Aduino. ToxFAQs(TM) for Aluminum – Government health report that downplays the health risks of aluminum.